Everybody will want to test there skill with this fun inflatable game of skill. This exciting game is sure to be a hit at your next event. This inflatable game is not only fun but also can easily fit in most indoor and outdoor areas. This game is 5� wide by 15�long and 8�tall. This game is suitable for ages 5 and up. 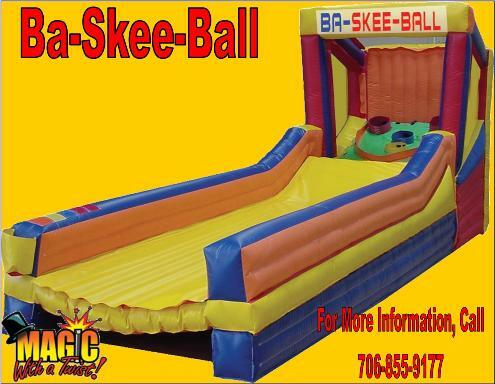 The Ba-Skee-Ball game requires a relatively flat area about 8� x 18' and within 100' of an electrical outlet. We prefer to set the inflatable up on grass. Please make sure all sticks, rocks and dog waste are cleared from the area before we arrive, to avoid delay in setting up for your event.